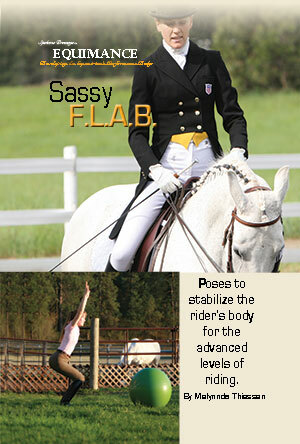 Rider Stability & Fitness, Equimance and Sassy F.L.A.B. For updated stability poses & bodywork exercises. Developing the performance body of the rider. A program of over 45 organized exercises for the rider's stability, available as a pdf download here. 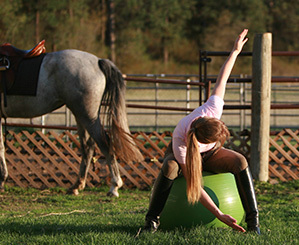 Rider stability is at the center of training at Spokane Dressage llc. The Goal: Developing the performance body of the rider. Working with all levels of riders from very beginning to the advanced levels has taught me that all riders benefit from a bodywork program off the horse. The idea here is to generate stability on the horse using poses off the horse. I have a background in many athletic arenas including Pilates, yoga, track & field, endurance riding and college athletics that have required high performance athleticism that calls on cross training. Dressage has been no exception. Hence, why I have brought these influences to my riders with fantastic results in their improved performance. After being asked many times to put together an organized program based on the work I do with each of my students, I have finally come to the table with Spokane Dressage llc’s Equimance. This is a program who’s aim is to enhance the rider’s performance body in preparation for the upper levels of riding. Click the image to the left to download a copy. Currently pdf is the only format available. Stay tuned for the print version. Follow the blog for exercises, fitness information and stability pose sequences. This is a bodywork program for riders. The program helps the rider identify 4 major areas of the body that effect the ride the most and then gives them a short program (under 15 minutes) to do just before they get on that works to stabilize those 4 areas.